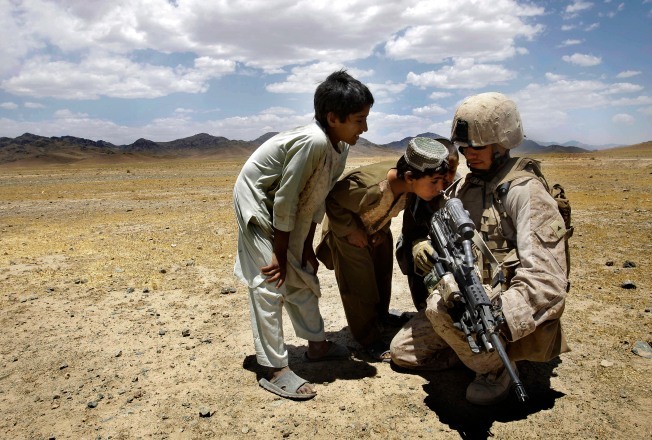 Afghani boys look through the rifle scope of a U.S. Marine during a visit to the village of Khwaja Jamal to meet with the local population. WASHINGTON - A Michigan company that manufactures combat rifle sights for the U.S. military that carry Bible verse citations said Thursday it would send kits to remove the inscriptions, NBC reported. The rifle sights, in use by U.S. forces in Iraq and Afghanistan, raised concern that the inscriptions break government rules barring proselytizing by American troops. Trijicon, Inc., of Wixom, Mich., sold more than 750,000 optical sights to the U.S. military with the tiny Bible references burned into the steel. The company said it would send 100 modification kits to the U.S. military that will allow removal of the inscriptions. Trijicon planned to also take off Biblical references from all U.S. military products that are still in the company's factory, and ensure future items do not have any inscriptions on them. One senior defense official told NBC News that the late founder of Trijicon was a devout Christian, and that the company had long imprinted its equipment with references to Biblical passages. Many of the references look like a serial number or identification number, and most troops didn't even realize the inscription was there, the official said. The defense official conceded that sights were problematic because the U.S. could turn them over to Iraqi or Afghan partners. Sights with Biblical references, the official said, are "definitely not appropriate." Military officials earlier said the citations did not break government rules and they wouldn't stop using the telescoping sights, which allow troops to pinpoint the enemy day or night.